Hackett, 62, joined Ford's board in 2013. Last year, he stepped down from the board in March 2016 to become chairman for Ford Smart Mobility. 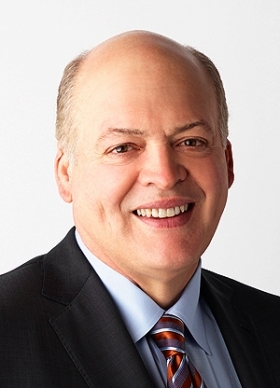 DETROIT -- Jim Hackett, the man named to replace Mark Fields as CEO of Ford Motor, is a former board member at the automaker who spent most of his career running a Michigan furniture maker before Fields tapped him to steer Ford’s investments in new forms of mobility. Ford announced Hackett’s appointment as president and CEO on Monday, saying Fields, 56, is retiring after less than three years in the posts. • Jim Farley, 54, head of Ford of Europe, becomes president of global markets and will return to the U.S.
• Joe Hinrichs, 50, president of Ford’s Americas unit, will be president of global operations. • Marcy Klevorn, 57, chief information officer, will be president of Ford’s mobility unit. Ford said replacements for Farley, Hinrichs and Klevorn will be announced at a later date. Also, Mark Truby will succeed Ray Day as the automaker’s communications chief. Ford said Day will provide consulting services until he retires next year. And Paul Ballew will be a vice president and chief data and analytics officer. Hackett’s automotive experience is limited to the three years he served on Ford’s board of directors, beginning in 2013, and 14 months overseeing Ford Smart Mobility, a subsidiary Fields created to coordinate work in car-sharing, ride-hailing, autonomous driving and other emerging trends. Hackett, 62, was CEO of Steelcase Inc., which makes office furniture, from 1994 through 2014. Bill Ford, Ford’s executive chairman, praised Hackett for dramatically improving the culture at Steelcase and making the company more innovative as the way its customers used their workspaces began changing rapidly. Ford and Fields have frequently spoken of their desire to spark a similar revolution within the automaker. "He is really a proven transformational leader,” Ford said in a Monday press conference after the announcement. "He is a visionary thinker." Ford said he was impressed to learn over the past year how many business leaders in Silicon Valley know and admire Hackett. Ford named several areas that the automaker needs to do better under Hackett, including making decisions faster, investing capital where it can create more value and more decisively addressing underperforming parts of the company. Hackett said Ford has been doing many things well but that he views the “fitness of the company” as something that will always need improvement. He did not directly address a question about whether the company needs to reduce the size of its workforce, beyond 1,400 salaried job cuts announced last week. He spoke highly of the cultural change that Alan Mulally ignited in eight years as CEO before Fields but said Mulally’s collaborative philosophy, which came to be known as One Ford, needs to evolve. “What it doesn’t do as well is it doesn’t handle when there’s lots of complex strategy decisions,” Hackett said. Hackett, who spent 33 years at Steelcase, is known for being an intent listener and finding innovative solutions to important matters. Hackett oversaw a major reorganization at Steelcase that involved cutting the company’s workforce dramatically and eliminating more than half of its facilities. Among those he had to personally pink slip was the best man at his wedding. He met with many of the laid-off salaried workers personally, eating breakfast with them and offering them assistance with networking or benefit issues. At the university, Hackett made a big impact despite his short tenure and lack of athletic management experience. His biggest legacy was hiring Jim Harbaugh as the school’s head football coach, a move that instantly vaulted the program back into the national conversation after a troubled seven-year stretch.